In a microwave proof bowl place the corn flakes and microwave at high for 3-4 minutes till they pop up and become crisp. Or shallow fry with little oil in a wok for a few minutes until you get a nice aroma. 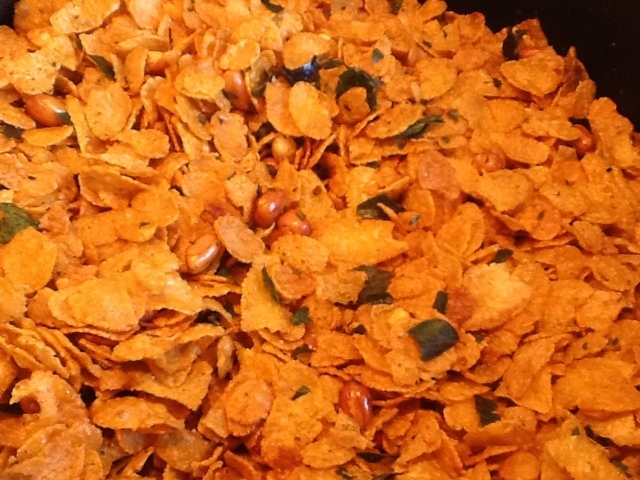 Mix once after every minute to avoid burning and to get a crisply done flakes. Transfer to a bowl. Now add a little oil and add in the peanuts and cashews.Allow them to pop and then remove and keep aside. Now,Heat a big pan / kadai with oil. Let it become hot, almost to a smoking level. Turn off flame and take off the stove. Immediately add red chilli powder, salt, sugar and curry leaves and mix briskly. Add all the roasted ingredients to the pan and mix gently till all the ingredients get well coated. Store in an air tight container and enjoy with a hot cup of Coffee/ Tea! !